One of the main veils that keeps people from seeing God is religious fanaticism. He says, it doesn't matter too much which school of Islamic laws you follow. There are different theological positions that is valid to adopt. Try and be orthodox, in fact its necessary to be orthodox, but whatever you do, don't turn it to some kind of zealot; so that religion just becomes a way of feeling that you are better than everybody else. Thereby veils you to God. - comment by T. J. Winter (also known as Abu Hakim Murad) - Lecturer, Islamic Studies | Cambridge University | from the film Al-Ghazali: The Alchemist of Happiness by Ovidio Salazar. a beautiful film i just watched and do recommend you to watch as well. from the imagery, portrayal of a great enlightened personality in world history to the message in the movie, its purely brilliant. 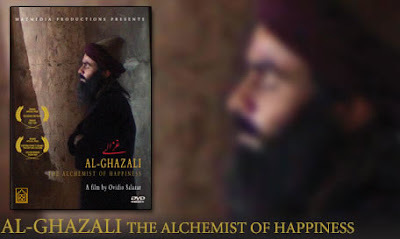 a film where the search of truth and certitude takes a professor and scholar of religion to the path of mystical path and inner truth of tasawwuf (sufi way) - thats the life of Imam Ghazali. who was Al-Ghazali | Born in 1058 in Tus, Khorasan, in present-day Iran, Abu Hamid al-Ghazali was one of the most original thinkers the world has known. Besides being a major influence in the Muslim world, the West has also felt his effect. He influenced major figures of medieval philosophy, such as Thomas Aquinas and Moses Maimonides, who shaped the philosophy of the Latin West. As the author of some 250 books on topics ranging from theology and ethics to metaphysics and philosophy, al-Ghazali came to be known as 'Proof of Islam.' For almost a thousand years he has served as an inspiration for spiritual seekers everywhere as he was someone, like the Buddha, willing to give up everything: wealth, position, family, and comfort in order to search for Truth.